This book is devoted to all aspects of the history of madder from cultivation, through process, economics and use of dye and pigment. The author has collected together in this one reference work the result of many years research. It is a mine of information. The book is not a light read and the first time I was able to get hold of a copy I only read the chapter on madder cultivation which I found of particular interest. Since obtaining our own copy I have discovered the book contains many additional snippets of information on cultivation and use which compliment our earlier article (see here). 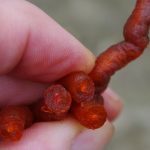 My interest, from the point of view of the small scale grower and crafter, covers those aspects of growing and using madder that could be employed on a domestic scale. In the remainder of this article I attempt to extract information of practical use (see comments in Red). The book contains information collected from multiple sources from all over the world but chiefly from the Caucasus and Russia. The focus is mainly on Rubia tinctorum but other plant sources of red dye are also noted, particularly Rubia peregrina (Wild Madder) which was used quite often when tinctorum was not available. 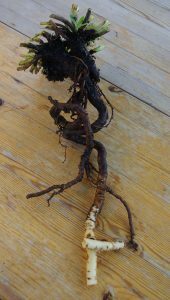 The roots of peregrina contain purpurin and little or no alizarin. Purpurin was valued for producing superior pink and violet shades. 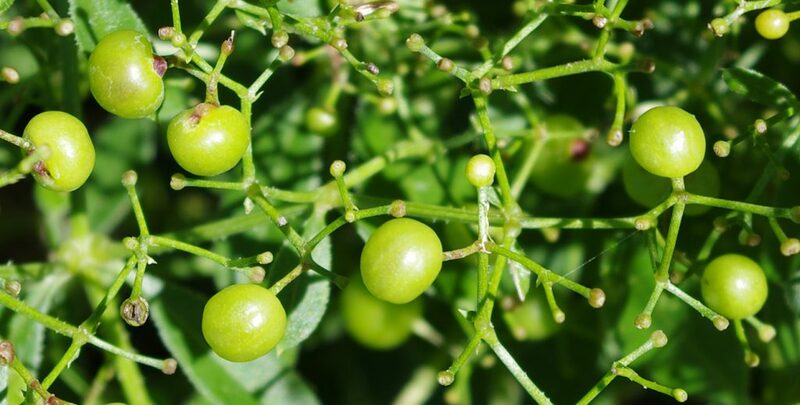 In different places madder appears to be adapted to local conditions and taking seed or plant material to grow in other parts of the world often resulted in failure – though this may have been due to inexperience of the new farmers. 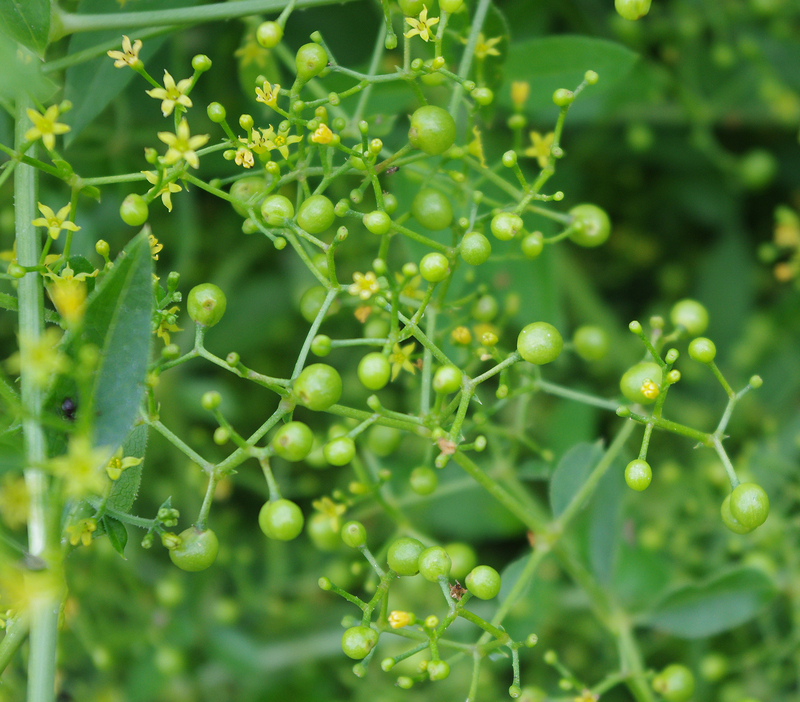 The book also confirms my own experience that the seed of madder is difficult to germinate and can easily become infertile due to poor storage. For the home grower this means using the seed as soon as possible (within a year of harvest). Farmers invariably preferred to sow seeds direct but only the most experienced could do this with success. New farmers preferred to grow the seeds in nurseries and then transplant into the fields when big enough or take rooted shoots from a field being harvested. 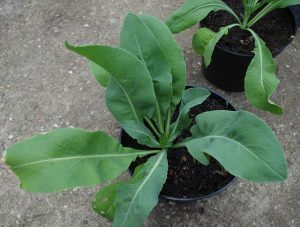 Transplanting was harder work (and so more expensive) but ensured a greater chance of success. Six months after planting, the rows of madder plants were “earthed up” (like potatoes) to encourage the plant to put out side shoots (underground stems) and protect the plant from drought in the summer and hard frosts in the winter. This practice is also reported as improving the quality of dyestuff. For the home grower this seems a sensible activity if you like to grow madder in rows as it would allow the roots to be more easily dug out. 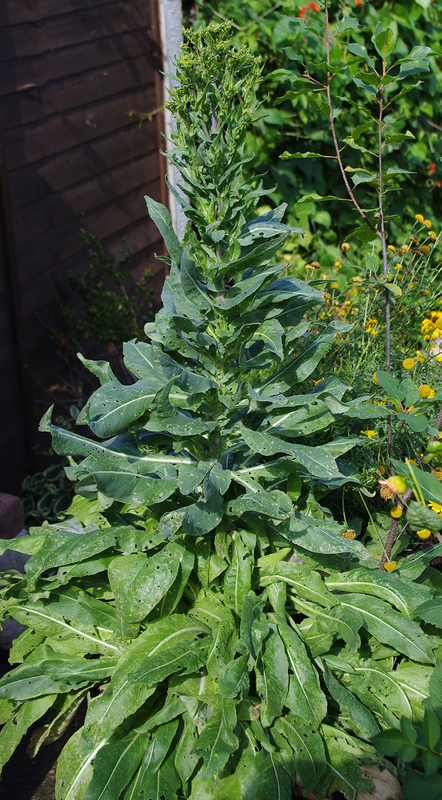 The main maintenance job is reported as weeding, with the most difficult weed being couch grass. I have to agree with this as couch grass has a very similar habit to madder and also forms a mat of underground roots which are extremely difficult to untangle once they get a grip. Most of Chenciner’s references to soil fertility indicate that madder harvests (weight of root and quality of dyestuff) will decrease over several years if grown in the same soil continuously – even if the soil is well fertilised with manure. A figure of approximately 6 to 12 years is mentioned as the maximum length of time that madder could be grown economically in the same field. After this time the land had to be left fallow or rotated for several years (4 to 12) before any further madder crops could be grown. Typical rotational crops were rapeseed, beans, wheat, hemp, turnips, beet, potatoes and cabbage. 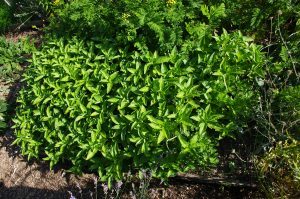 Several references are made to observations that madder grew best on virgin ground which is much the same as any other crop, but the failure of manure to restore fertility suggests a depletion of some micro-nutrient not present in manure. The only suggested method of restoring fertility quickly was to add “natron” and common salt. Natron is a mixture of hydrated sodium carbonate salts and other salts found in dried up lakes. For the home grower it may be possible to substitute common washing soda for natron but I would not recommend doing so without careful experiment first to find out how much to apply. Washing soda is a powerful alkali and sprinkling it on soil could do serious damage. Adding small quantities of sea salt (35g per m2 about twice a year) may be a better solution but be careful not to overdo it. Rock dust may also do the job. How long to grow the plant before harvest? Older roots (3 to 5 years) produce the best quality dyestuff. Economically it was best to harvest after 1 to 2 years. As you can imagine 3+ years is a long time to wait before being paid, particularly if as an “adventurer farmer” you had to pay rent on the land/accommodation and feed a family during this time. Most successful ventures appear to have been run by established land owners who had minimal overheads and additional sources of income. Some farmers did practice a form of partial harvest where a trench was dug beside the row of madder plants. Roots found in the trench were harvested without killing the main plants which continued to grow for a further year or two. 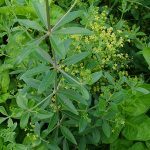 This practice makes home growing of madder considerably less of a wait though the final harvest may be reduced. The first procedure after digging the roots was to steam them, a practice carried out in the field by a team of specialists. All sources are clear that this process increases the amount of dyestuff in the root and after about 4 to 5 hours the roots would turn from yellow orange to a strong red. A hole was dug in the ground and a fire lit. When the surrounding soil had become baking hot, madder roots were piled on top and then the whole heap was covered in damp cloth or similar material to keep the hot air in. Although we have never tried this I see no reason why it would not be possible to do this at home using standard vegetable steamers. The exact method will need to be worked out by experiment. There are very few reports of root washing in the book and when it is mentioned it is not recommended for fear of loss of dyestuff. 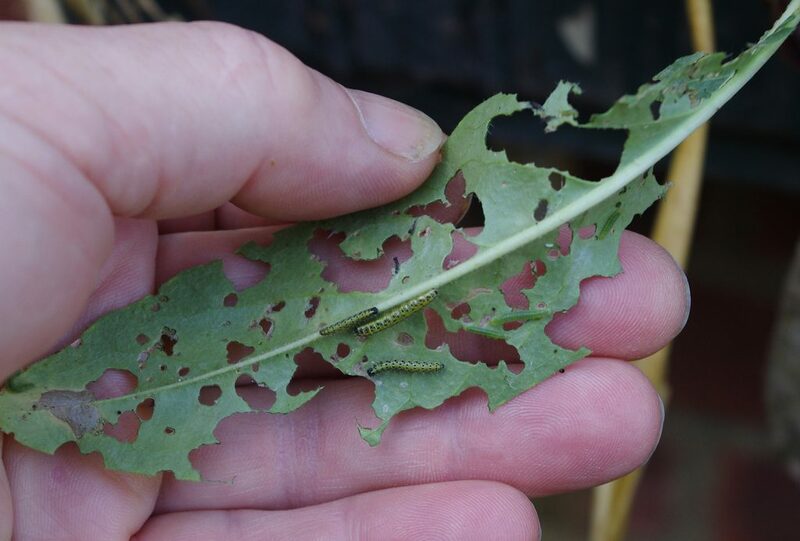 I would guess that the growers wanted to keep even the poor quality brown dyes found in the thin skins. Any soil clinging to the roots would just add to the weight of the final product, so more profit! In the Netherlands and Britain this was done in specially built heated drying houses as the climate here was not hot enough to dry outside. Even in the Caucasus and other hot dry areas most growers preferred to dry in the shade rather than direct sun. This slow drying is reported as another essential process to further increase the amount of dyestuff in the roots. Roots were often stored for one or more years to allow them to mature before being pounded into a fine power or “krap”. The roots had to be brittle dry before pounding otherwise the root would stick into a hard cake. For the home grower the important features of this drying process is the temperature and the length of time. The recommended temperature was between 20°C and 30+°C so drying in an airing cupboard would probably work well with storage in a warm dry place after the roots have dried out completely. Fermentation was sometimes done before pounding, sometimes afterwards and involved placing the root material into a vessel with water for a short time (a few days) during which time the sugars in the root were fermented out. Removing the sugar was important as later fermentation in the dye bath interferes with the dyeing process. From the home dyer’s point of view this is not so important unless you make your madder dye bath a day or two before using it. When the madder industry was in full swing the roots were pounded in large horse-powered or water-powered mills and the resulting powder or krap was sorted into a variety of grades. The main problem besetting the root processors was separating out the “tough” outer skin which contains the brown dyes that would dull the final dyed product from the inner “parenchyma” part of the root which contained most of the dyestuff. Exactly how this was done is not explained but logically krap was probably sieved into coarse and fine fractions and the first powder produced after partial pounding would have presumably contained most of the bark. For the craft dyer pounding is not really an option. It may be possible to grind the root in coffee bean grinders but only if you are prepared to say goodbye to the grinder. The metal blades in such grinders could be a problem if they become rusty and end up adding iron to the dyestuff which would sadden the colour. Chenciner reports that some pounding mills used wooden hammers with ends strapped in metal (possibly iron) so the danger cannot be catastrophic. 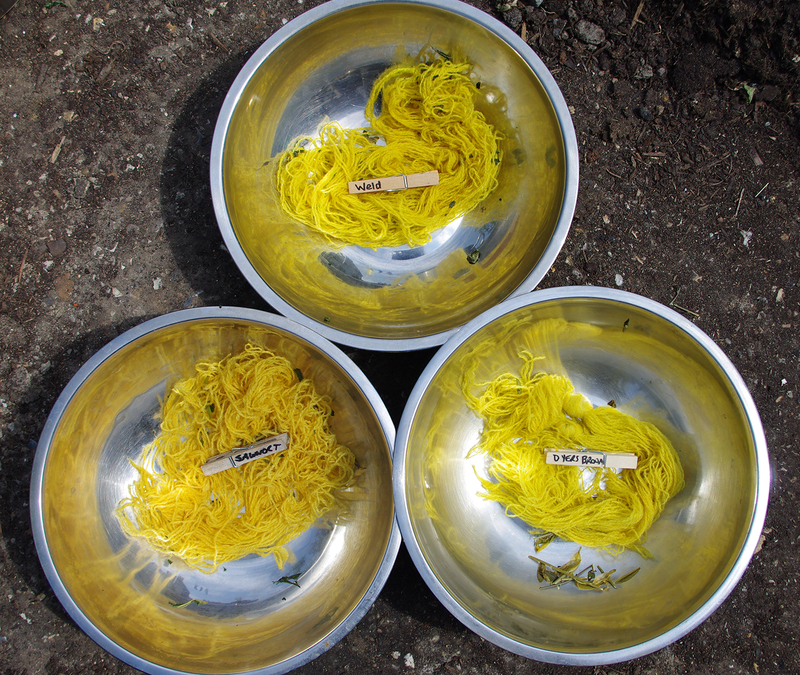 There has been some confusion amongst today’s craft dyers about exactly which part of the root contains the dyestuff. Nowhere in the book does the author note the differentiation of root into ‘true roots’ and ‘underground stems’ or rhizomes, although some of the quotes from historical documents do allude to this. The root is invariably described as having a thick tough bark but this is clearly an impression formed by looking at the dried root. The skin of fresh root is very thin and can be easily scrubbed away on an individual root but this is probably not possible on a large scale without losing a lot of the underlying dyestuff. 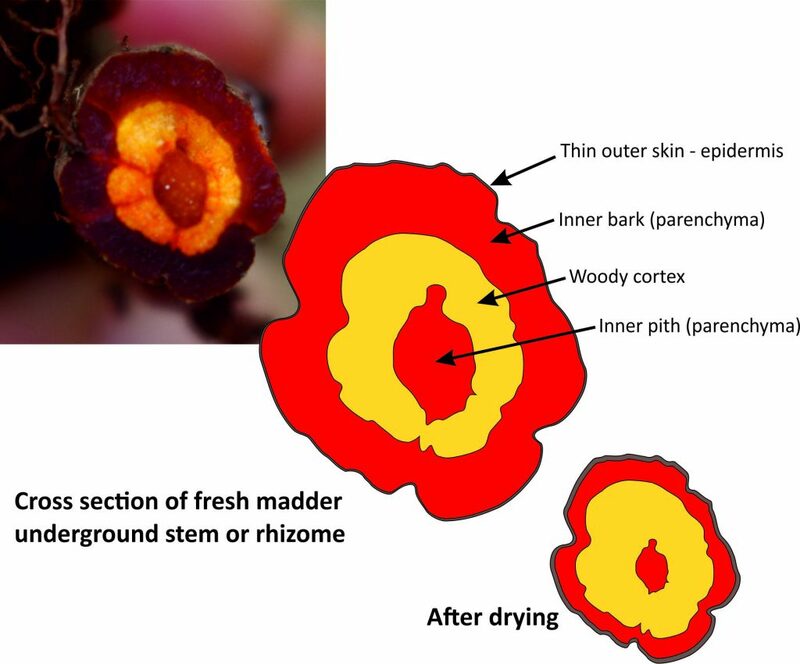 The position of the dyestuff in the root is usually described as being just above the woody cortex, but again this is probably a description of a dried root where the soft fleshy outer material has shrunk to a thin layer of concentrated dye bearing material just covering the woody cortex. In the shrinking process, the outer skin wrinkles up and appears to become quite thick. 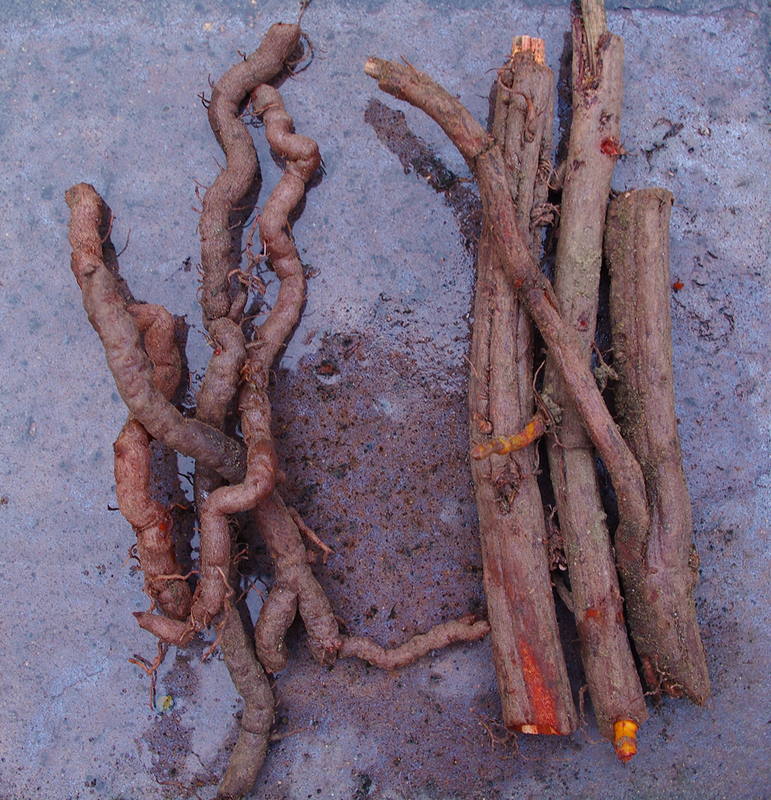 In theory it would be possible to hand wash fresh roots then pound the roots in a strong pan until the woody cores could be removed and the remainder left to dry. This would be very labour intensive however and the inner pith from root stems (which also contains dyestuff) would remain in the removed woody material. 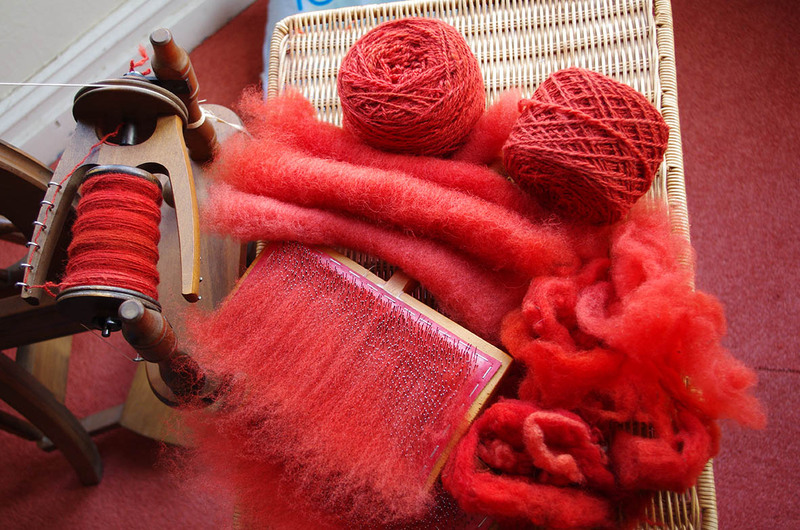 During a Turkey Red workshop run by Debbie Bamford (The Mulberry Dyer) at the 2013 Spinners Weavers and Dyers Guild summer school an experiment was done to try and separate the outer part of the root from the inner cortex and test the resulting material for dye strength and colour. 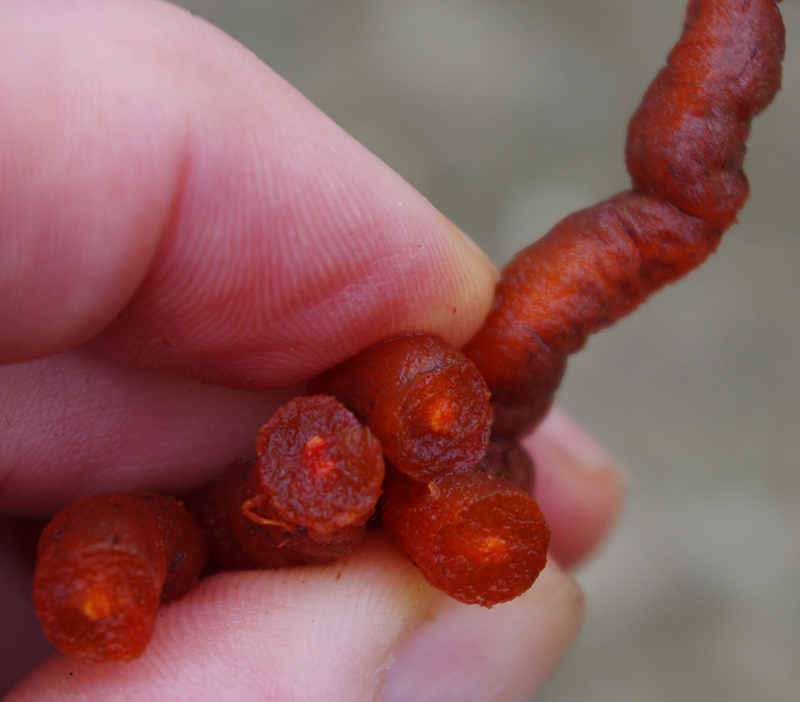 Most of the commercially obtained dried root was actually root stem with the characteristic central dot of red pith. The outer layer of bark and inner dye-rich material was shaved off with potato peelers, down to the pale woody cortex. It was not possible to remove all the dark material. Equal weights of shavings and inner cortex were then used in identical dye baths. The shavings gave the darkest red with little if any dulling due to the presence of outer bark. When the Madder industry expanded in the 18th and 19th centuries it was not long before competitive manufacturers began to invent new mechanised ways of refining the krap to increase its quality. The first breakthrough using a complex chemical treatment resulted in “garancine” which was later purified even further into “flowers of madder” which was almost pure “alizarin” (the main dye chemical in madder root). These refined products enabled the dyer to dye product quickly, easily and reliably. Krap became an inferior grade product and perhaps contributed to its entry into the dictionary as the word “crap” meaning rubbish. For the home dyer, refined madder root products are still produced and sold as madder extracts but these are expensive and I think less exciting than growing your own or making do with chopped root or krap. Home refining is possible (see Michel Garcia) but you do need some specialist laboratory equipment. 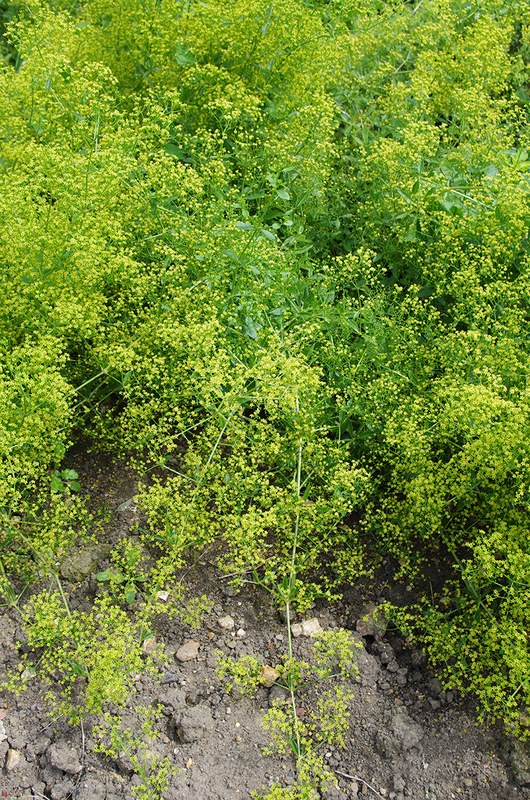 Chenciner is particularly interested in the economics of madder growing, processing and use. 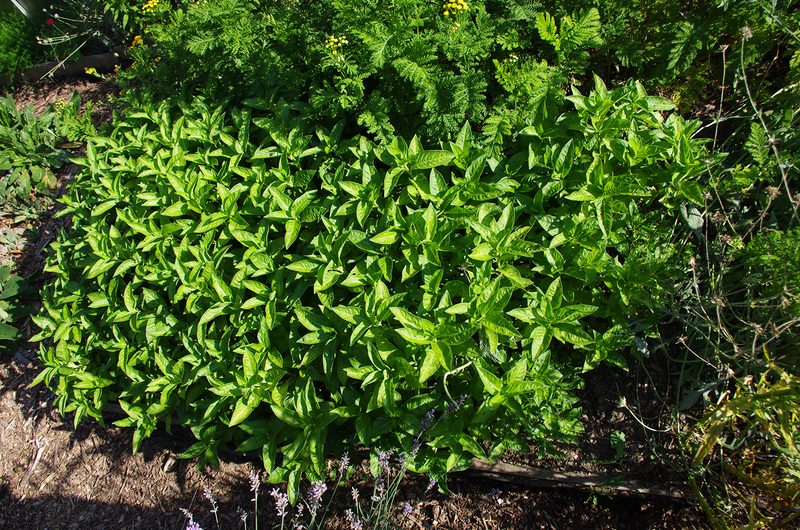 As a very high value product, madder growing attracted “adventurer farmers”. It is hard today to imagine farmers being put into the same class as gold prospectors but the potential returns on investment were such that many amateurs were drawn in. Of course many of these inexperienced adventurers were doomed to failure. What seemed like a shortcut to riches and fortune soon turned into a nightmare as old seeds sold by unscrupulous traders failed to germinate or the crop simply failed to grow well or any number of other disasters befell the hapless farmer. Contained in the text are numerous recipes for the processing of madder and dyeing of various fibres and textiles. These recipes are often quoted without interpretation into modern terminology so often remain obscure. However, they do offer a fascinating window into historical techniques and a platform for modern attempts to duplicate them. Dyeing in Rose Colour Rose colour is dyed in the following way. Smear the rolls of wool with ashes, untie them, and wash the wool in the liquid from potter’s clay. Rinse it out and mordant it as previously described. Rinse it out in salt water after mordanting and use rain water (which is so) warm that you cannot put your hand in it. Then take for each mina of wool a quarter of a mina of roasted and finely pulverized madder and a quarter of a choenix of bean meat. Mix these together by the addition of white oil, pour it into the kettle and stir up. Put the wool in the kettle and again stir incessantly so that it becomes uniform. When it appears to you to have absorbed the dye liquor, however, brighten it by means of alum, rinse it out again in salt water, and dry it in the shade with protection from smoke. 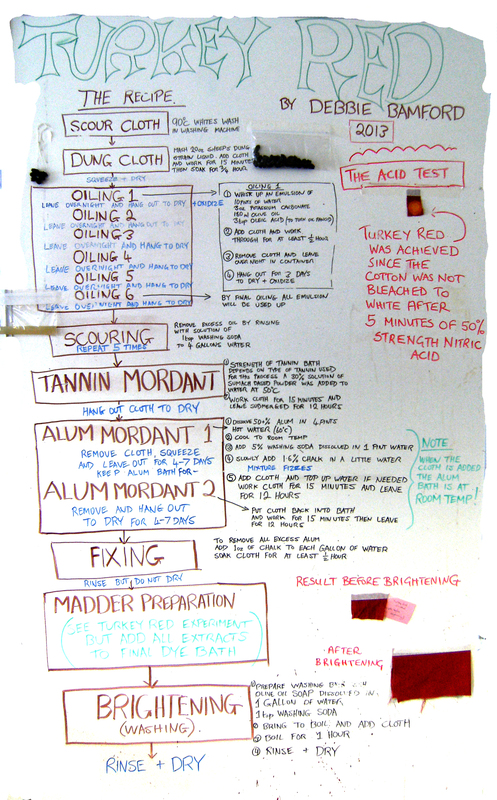 This entry was posted in Ashley's posts, Grand teint, growing dye plants, history of dyeplants, learning to use dye plants, madder, Robert Chenciner and tagged Common Madder, Grand teint, Growing dye plants, Madder, Madder Red, Natural dyeing, Rubia tinctorum on 3rd March 2017 by susan dye. 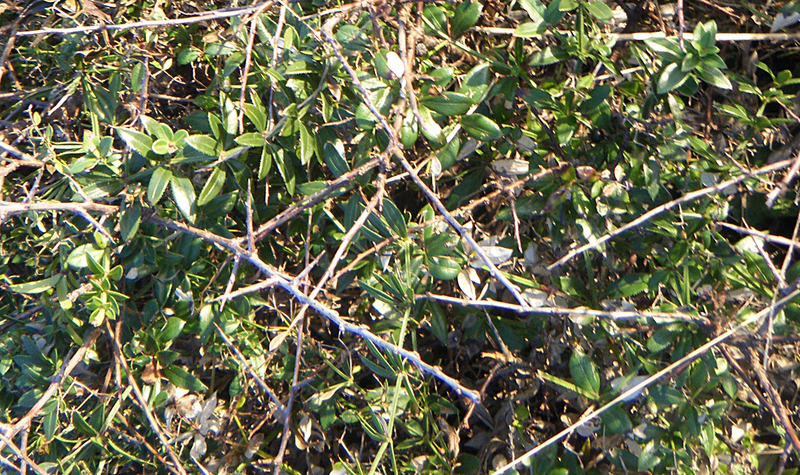 Common Madder (Rubia tinctorum) is an excellent source of red dye. It is indigenous to Southern Europe, Middle East, Central Asia and North Africa but has many close relatives (in the genus Rubia) around the world. As a herbaceous perennial, Common Madder dies all the way back to the soil at the end of every year. 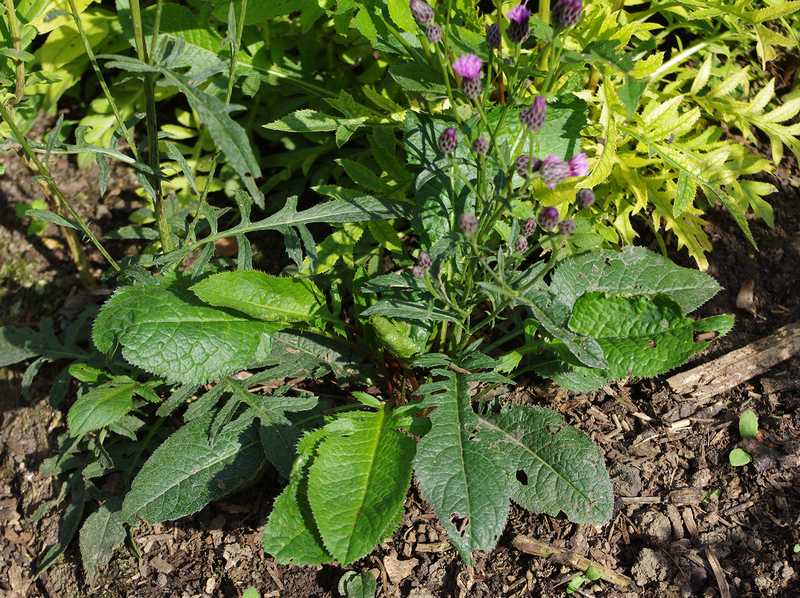 This means that madder beds can be mulched over the winter to suppress weeds and protect the soil from nutrient loss. Mulching with well-rotted manure or other soil improvers will have the added benefit of fertilising the soil. 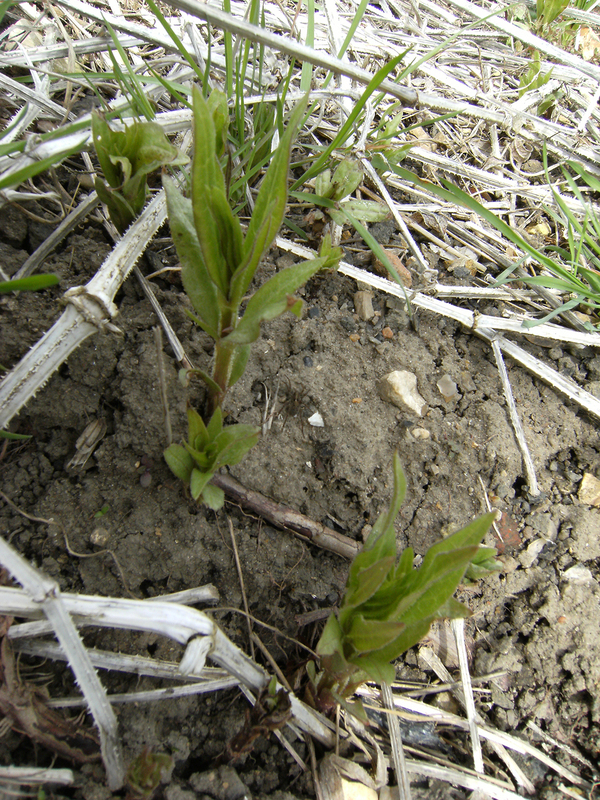 Madder shoots appear in March and will withstand mild frosts. 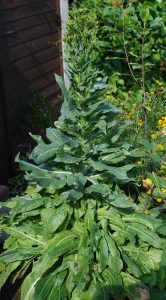 They grow into a mass of long clambering stems which need support to grow above a foot or two in height. 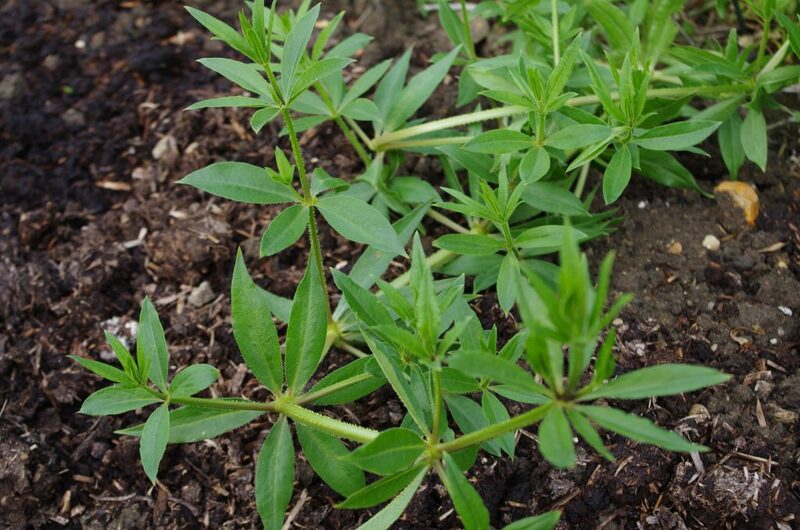 Madder will tolerate coastal conditions of wind and salt and is highly resistant to pests and diseases. 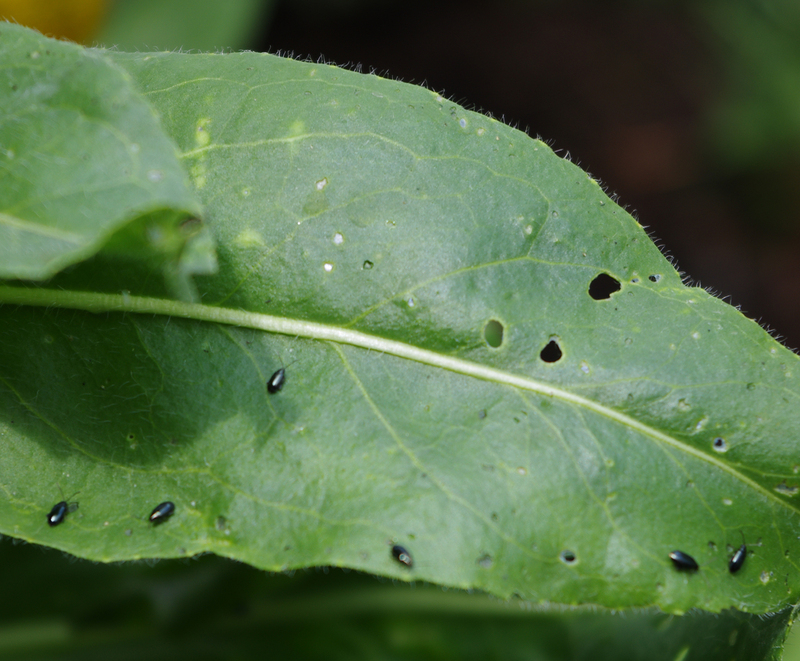 Seedlings will benefit from protection from slugs, but the shoots of mature plants need no protection. Growth can always be improved with a little fertiliser and watering in hot dry weather but we generally leave our madder to fend for itself and it still gets good harvests. The green part of the plant contains very little dye stuff but was used as animal fodder and reportedly would turn their bones red over time. 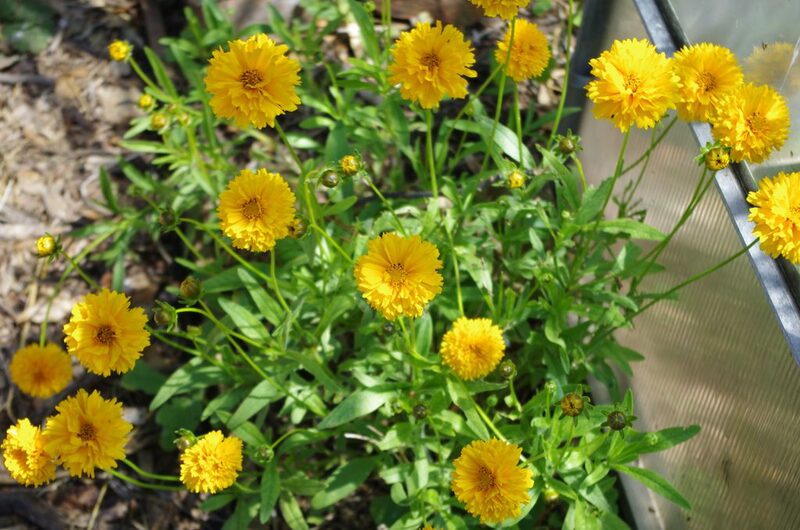 Growing Common Madder requires considerable investment from the dye plant gardener. From seedling or cutting it takes three to four years before the roots have swelled to provide a satisfactory harvest. Time is not the only consideration either. 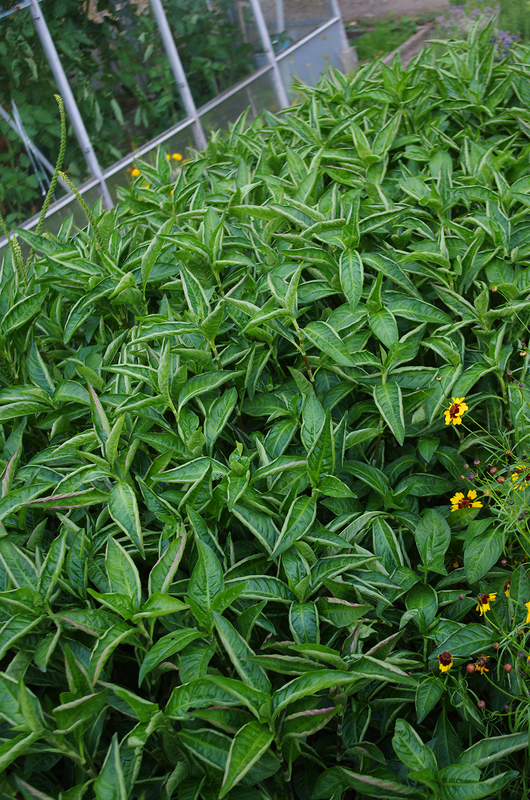 The plant is highly invasive and if neglected it will spread to the rest of your garden. The plant’s main method of propagation is the underground stem which grows horizontally under the surface and pops up one to three feet away. 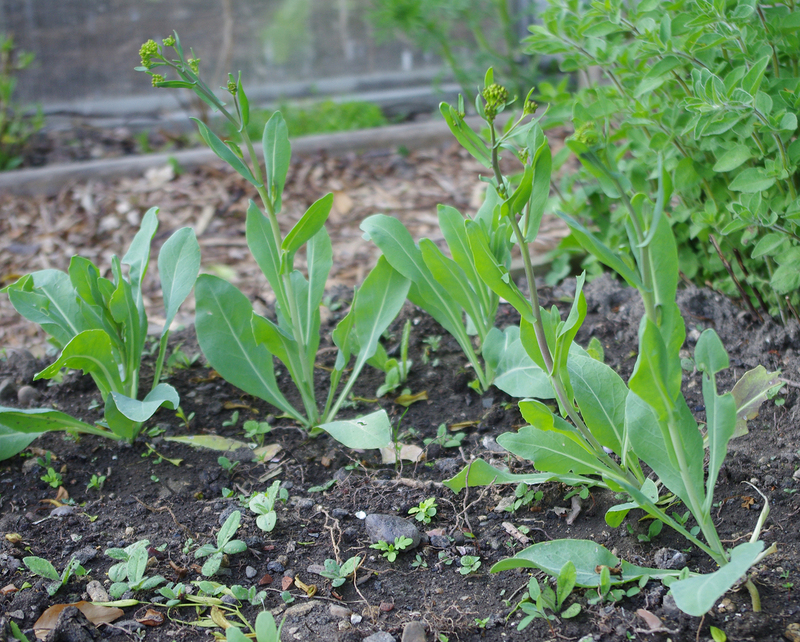 If you are a diligent (and ruthless) gardener you can keep on top of it by pulling up the shoots every time they reappear. 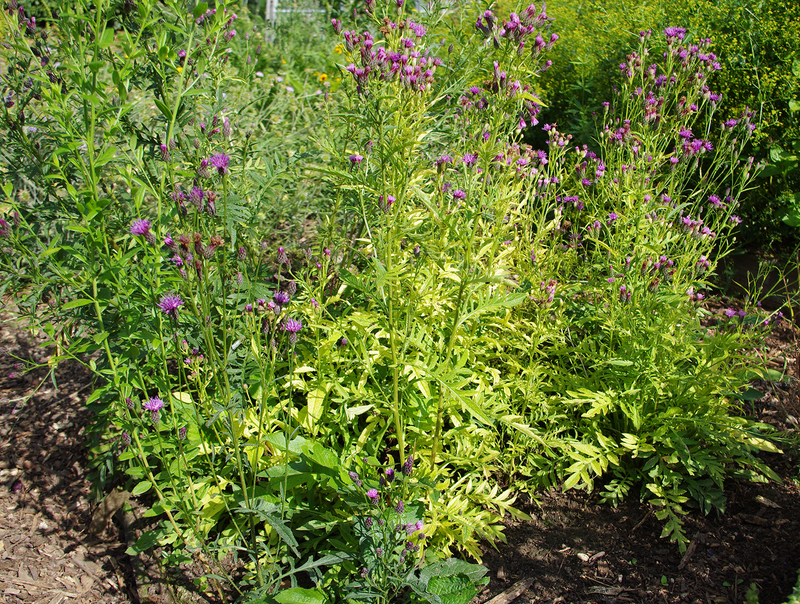 Our approach is to set aside part of our vegetable allotment for madder. We remove stray roots as and when we dig the vegetable beds over. In ten years we have only once had to take more drastic measures when the madder was heading for the neighbour’s allotment. 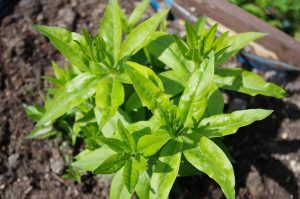 Madder roots and shoots are relatively thick which makes them easy to remove when digging; keeping the plant under control is far easier than dealing with perennial weeds like bindweed and couch grass. 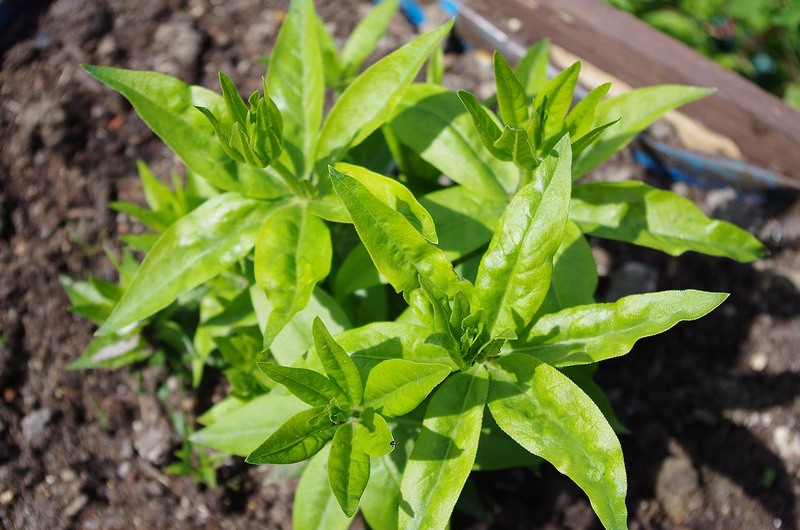 If you have no ‘out of the way’ space suitable for madder and you maintain an ornamental garden, madder can be grown in a large raised bed with deep walls to prevent the underground stems from escaping or, failing that, a very large planter. 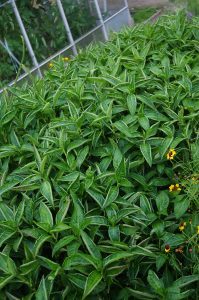 Setting up a separate raised bed each year for four years would allow you to harvest madder every year. The larger the container or raised bed the better. 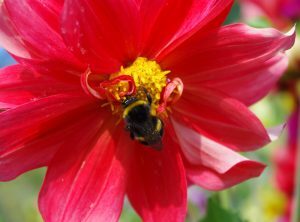 As with all container gardening, the plants will need extra attention to watering and feeding compared to madder grown in open ground. 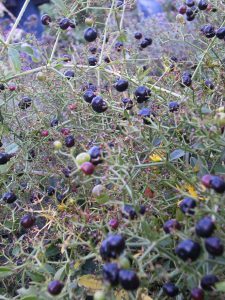 Madder berries turn from green through red to black. 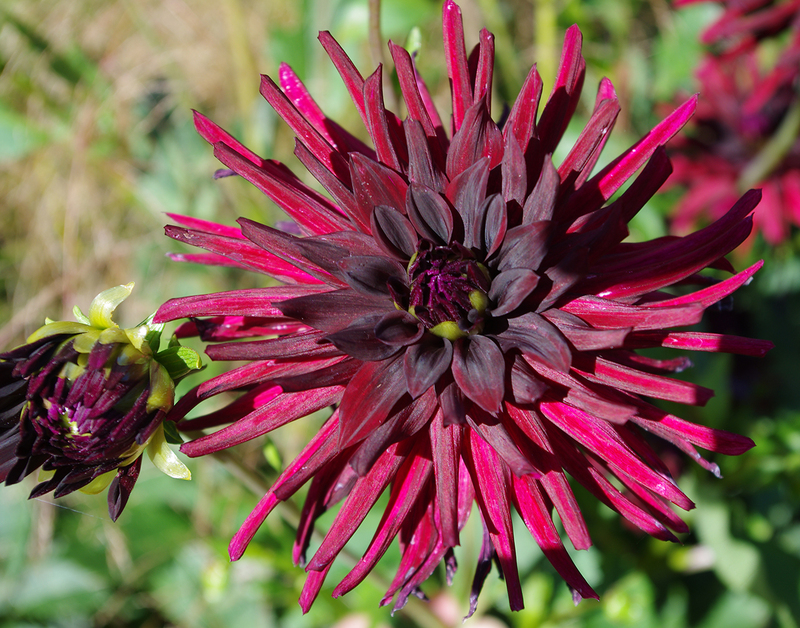 Although the black berries produce a wonderful red juice it does not appear to be a useful dye. 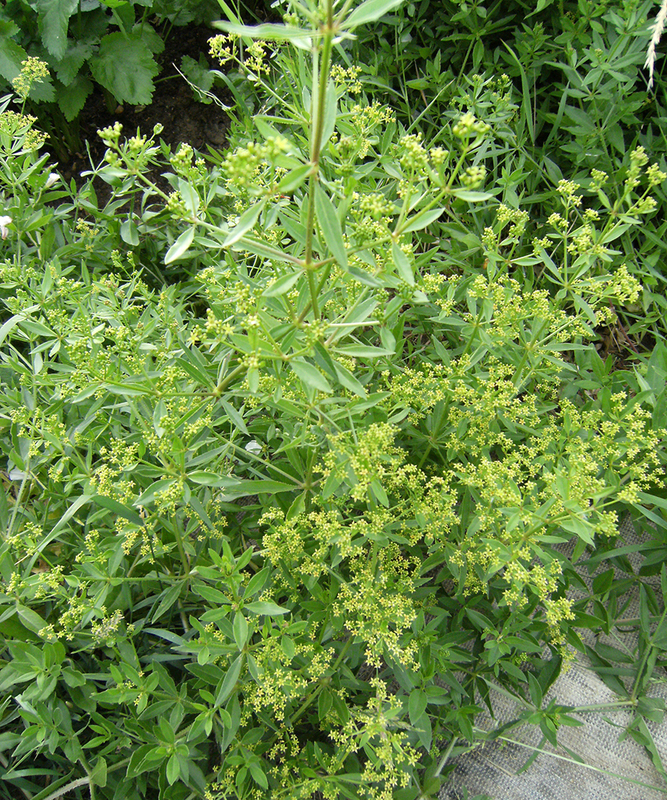 Madder also propagates itself by seed. The seed of Cleavers (a close relative) is covered in tiny hooks which attach to passing animals. 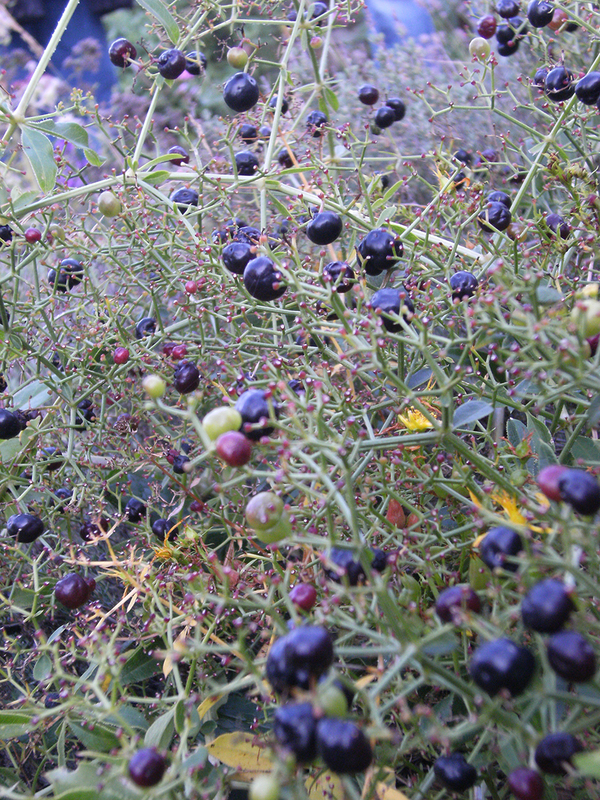 With Common and Wild Madder the large seeds are surrounded by a juicy black berry which is eaten and spread by birds. 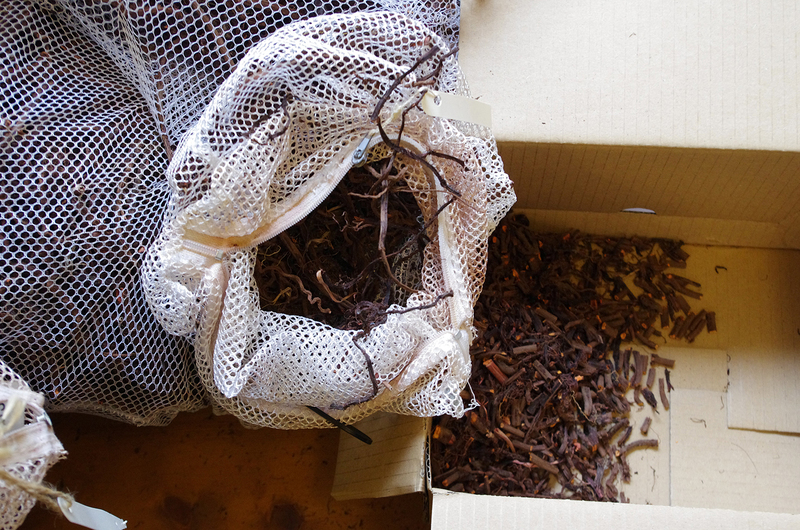 Madder seed once dried is notoriously difficult to germinate. 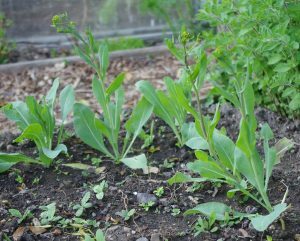 Many sources suggest that it will self-seed readily in some countries but we have never come across a seedling in our allotment. 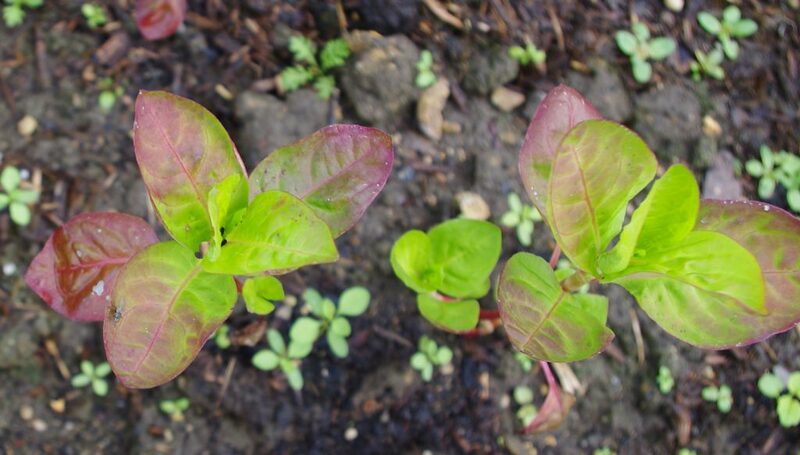 All of our madder beds were derived from a single seed we managed to germinate many years ago. 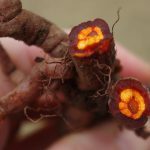 So if you know someone who is already growing madder ask them for a root cutting from the underground stems in the spring and you may save yourself a lot of time. 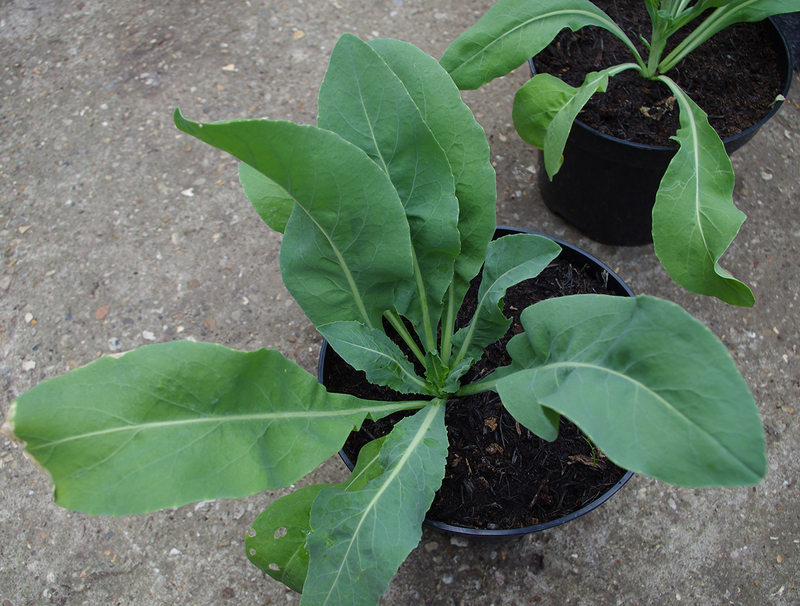 Note: If growing from seed I previously recommended using advice from a scientific paper  which had found that soaking the seeds in very hot water for a few minutes would help break the seeds dormancy but having tried it ourselves I can categorically withdraw this advice. DO NOT DO IT! All I managed to do was kill the seeds! I will be writing up the results of this experiment soon. 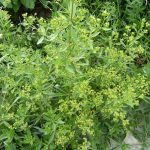 With its scrambling habit and close resemblance to cleavers, most people would not judge Common Madder an attractive garden plant. 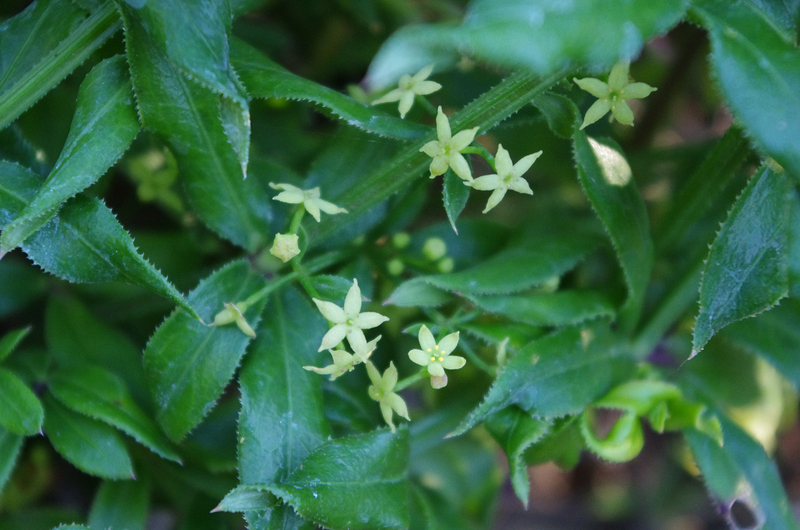 However, if weeds are kept at bay, large beds of madder produce beautiful clouds of tiny yellow star-shaped flowers in July/August and glossy black berries in October. Providing support for it to clamber over also improves its attractiveness. There are two main types of root: bulbous true roots and straighter underground stems or rhizomes. Once established, the adventurous rhizomes soon start to swell and take on some of the characteristics of real roots. They begin to produce and store the various substances that bear pigment. Both true roots and new plant shoots grow from these rhizomes. 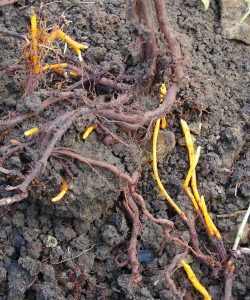 The bulbous true roots are the most prized by dyers but three year old underground stems can be just as good so do not discard them. 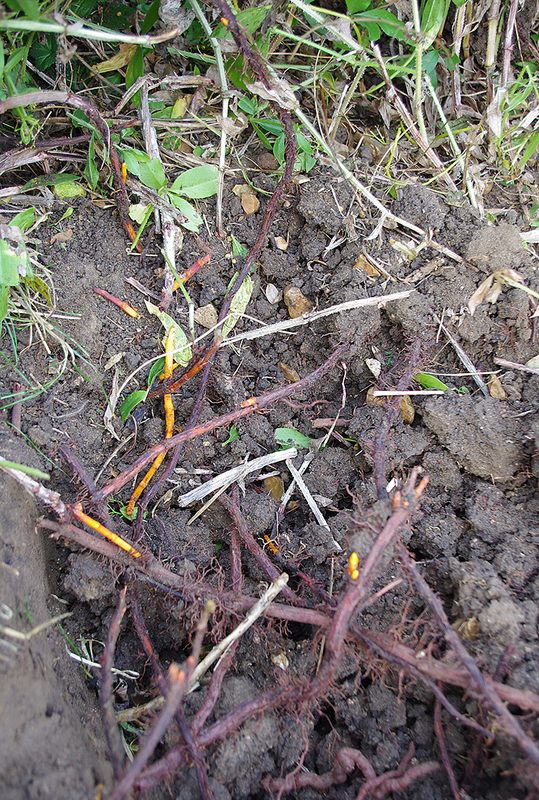 The bright orange shoots are new growth stems. Network of underground stems just under the surface. 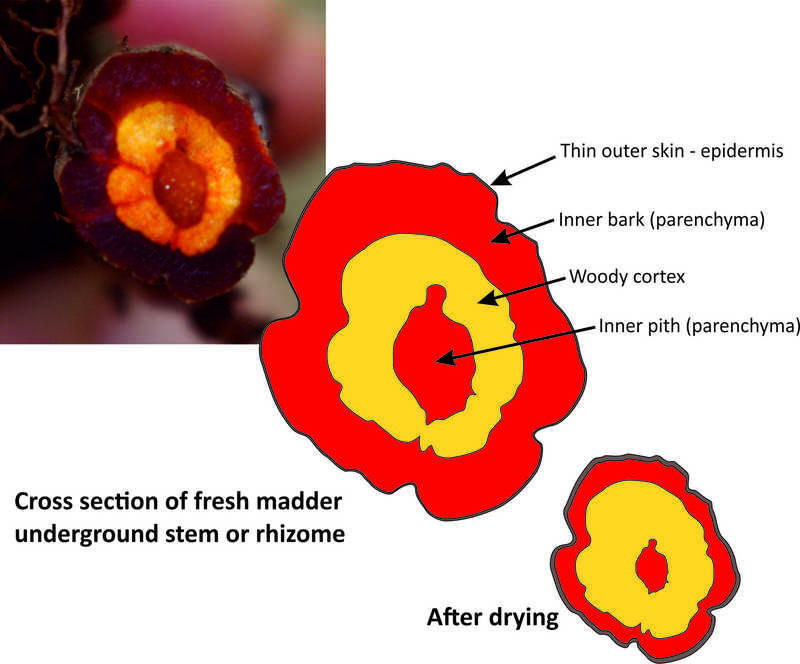 Cut underground stem, note the orange woody ring with red center of pith. 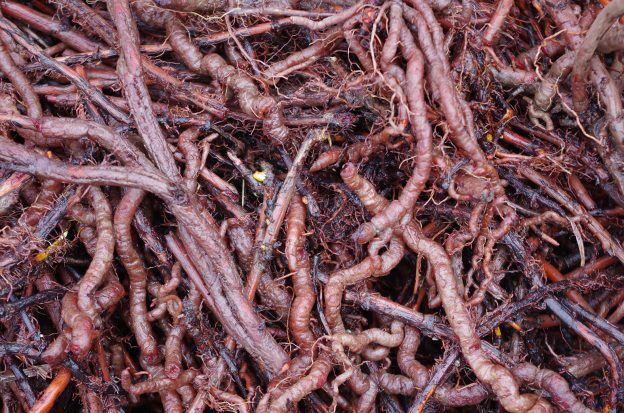 Having to dig up the root is often cited as a barrier to growing Madder, particularly if the soil in your garden has a lot of clay but there are many ways to make the task easier. If you do have heavy soil invest in several bags of soil improver and a few bags of sand and dig in well before planting. 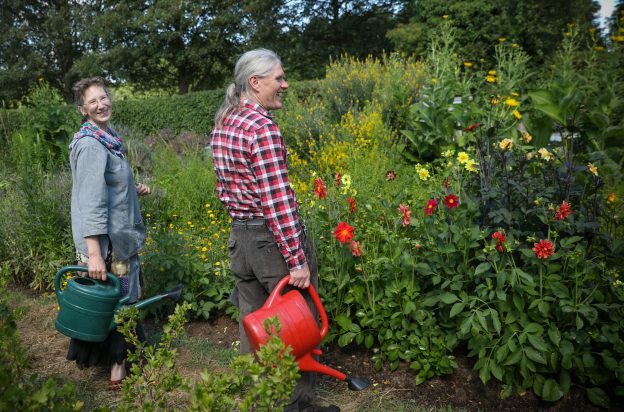 If that sounds too strenuous, create a “no dig” bed and spread over it a very thick layer (at least one foot or thirty centimeters) of a mixture of manure, soil improver and sand. Top this up in the second or third winter. 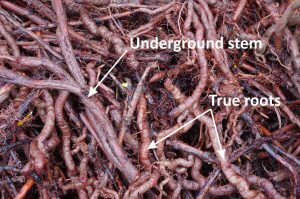 It is true that madder roots will go very deep (several feet) into the ground but there is no need to dig down that far as most of the roots, including the largest ones, are usually near the surface. 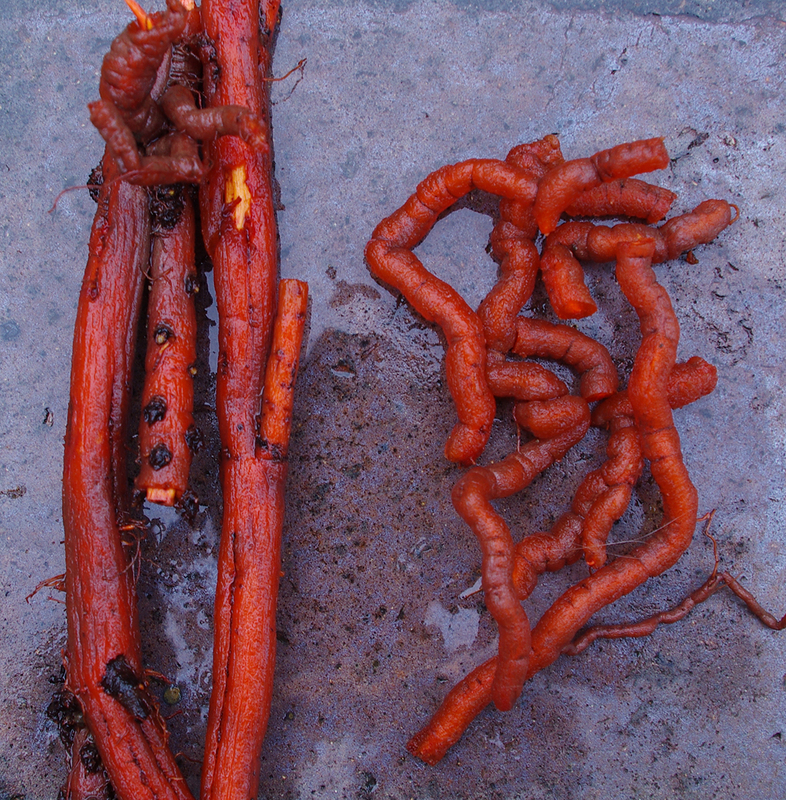 Root stems and rhizomes before and after washing. With a little gentle brushing the outer surface of bark (which contains brown dyes) can be removed to reveal the orange flesh of the root. 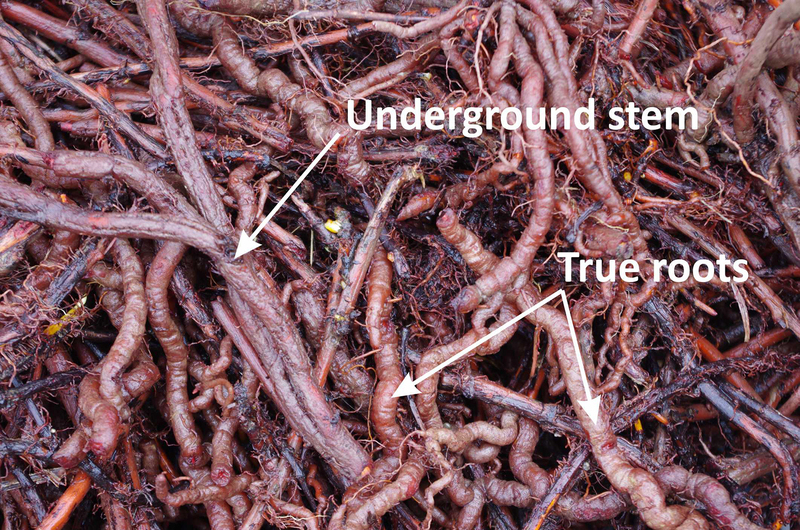 The difference between root stem or rhizome and true roots is seen here . 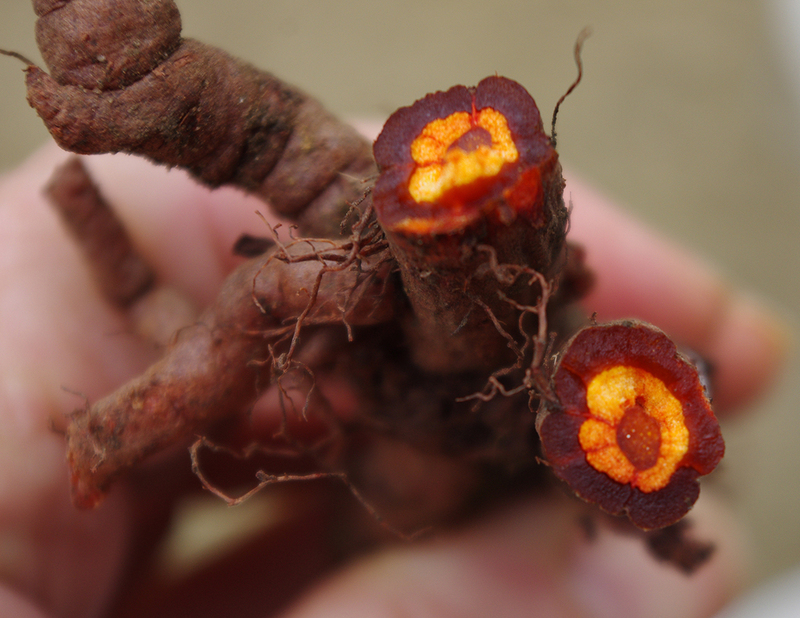 Root stems are invariably straight and have a woody ring with red pith centres. 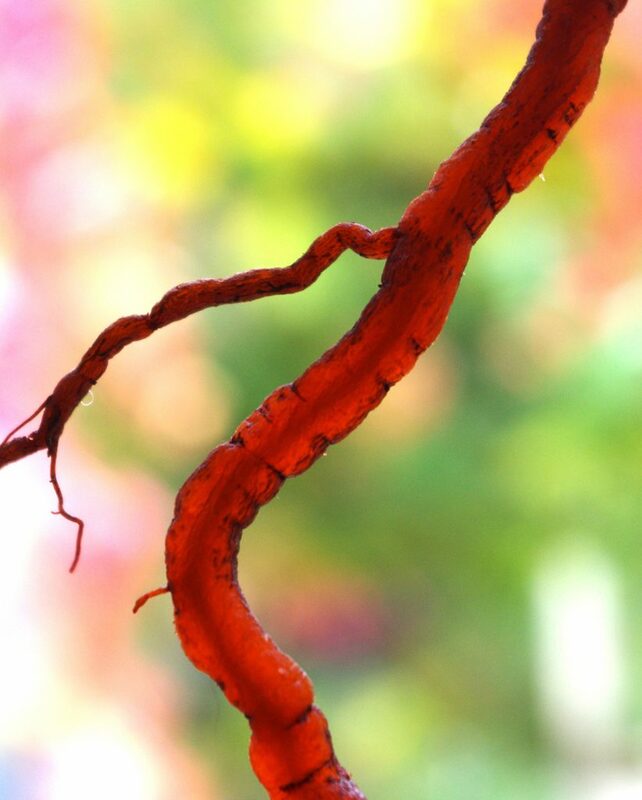 True roots are twisty and have a thin woody centre. Soil type is not important to the health of the plant but growing madder in an alkaline soil stimulates the production of the red dye stuff. We are fortunate to have a light chalk soil in our garden which is already quite alkaline. For acid soils an application of lime will improve the dye yield. 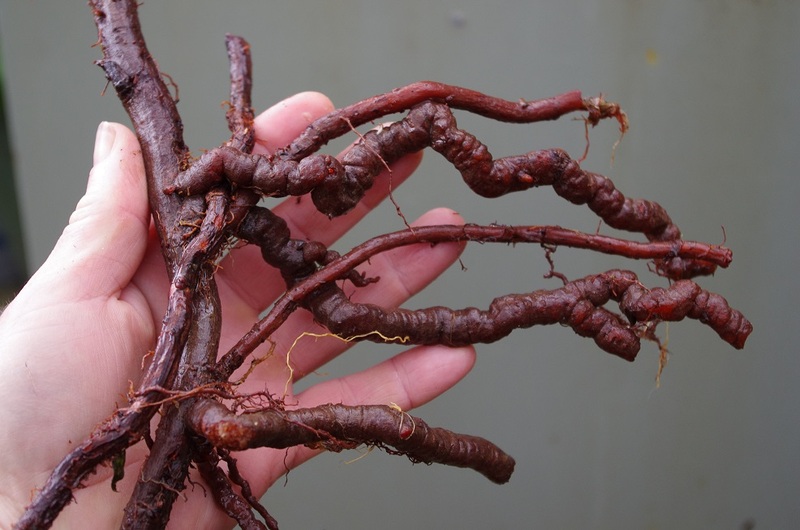 The general consensus is that the best time to dig Madder in Northern Europe is late Autumn, after the roots have been replenished by a full season’s growth. The worst time to harvest is Spring when all the nutrients are coming out of the roots and going into new growth. 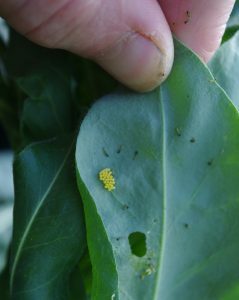 However, we have harvested at all times of the year and found that the results are similar so don’t be too constrained by the literature. Of more import is what you do with the roots after harvest. Once removed the outer bark reveals the translucent orange flesh. The central woody core can be seen here through the root. First they need to be washed to remove loose soil. This can be done with a hose connected to the mains and the spray head set to a narrow jet. 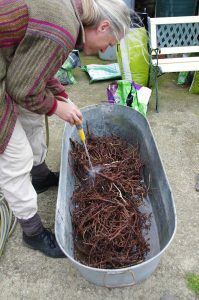 We leave the wet roots to drip dry outside in net wash bags and then move them to a warm, dry place out of direct sunlight where they will get plenty of air circulating around them. It takes around one to two months to fully dry the roots, when they can be snapped by hand or chopped up for storage in air tight containers or paper bags in a dry place. Slow drying followed by long storage allows more of the precursor substances in the root to be converted into alizarin which is the substance that gives the classic pink/red. The root is admittedly easier to chop when fresh but then much more difficult to dry unless you have access to a herb dryer. 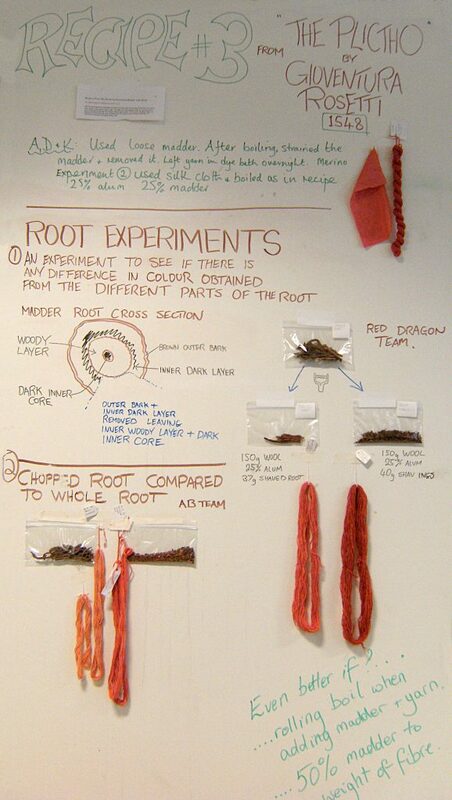 The clean roots can be used immediately but remember that most dye recipes specify quantities for dry root. Our experiments show that drying reduces the weight by a factor of six. So rather than 50% weight of goods you will need 3 times the weight of goods in madder. Fresh root is also useful for dyeing cloth in eco-bundles. The dried root is chopped up for final storage. Although it involves more work and considerable patience, we much prefer to dry the roots and keep them for a year or so before use. Indeed we think that along with our chalky soil and hard water, this may help to explain our success in achieving very good reds from our home grown madder. It could be argued that Common Madder, being so easy to grow and yielding a great deal of pigment is the only dye plant in the UK worth growing for reds. 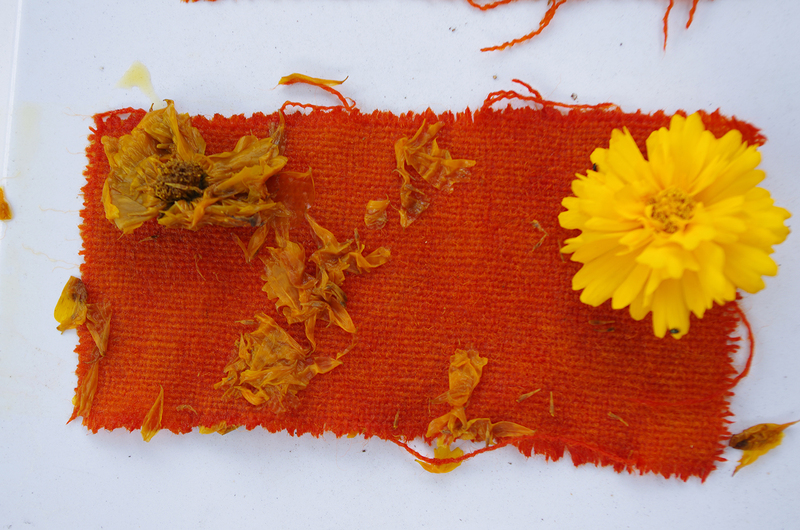 However why should we limit our plant dye and botanical knowledge in this way? 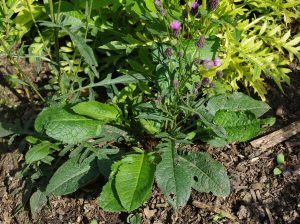 There are a number of related plants which have played an important historical role where soils are not well suited to Common Madder. 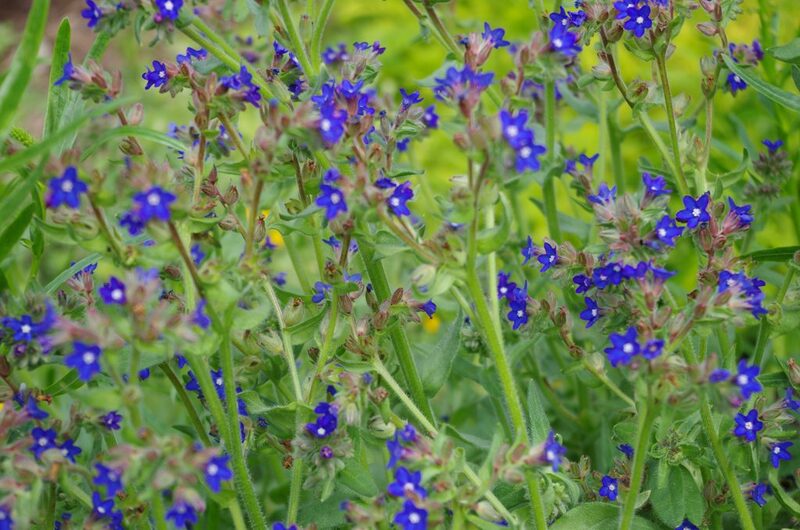 While it is against the law to uproot any wild plants, many of these can be easily grown from seed and some are available from wildflower nurseries. Examples include Field Madder (Sherardia arvensis), Wild Madder (Rubia peregrina), Lady’s Bedstraw (Galium verum) and Dyer’s Woodruff (Asperula tinctoria). 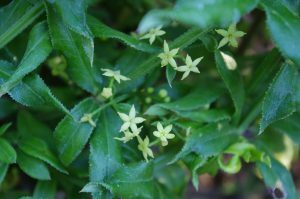 Wild Madder appears very similar to Common Madder but is evergreen and grows wild in South West England and South Wales. 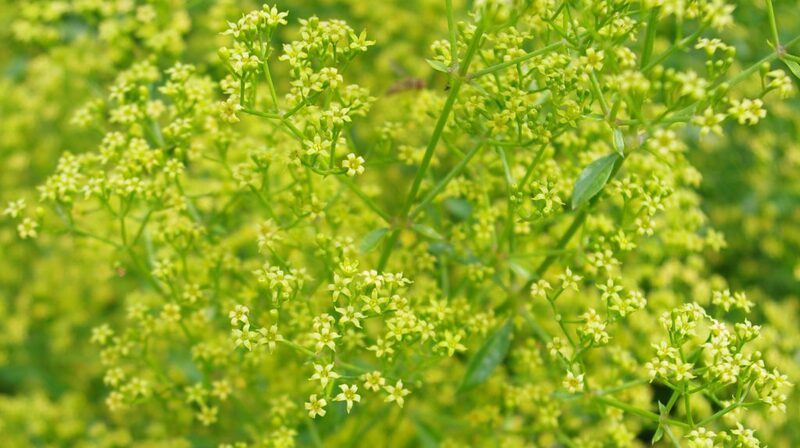 Lady’s Bedstraw is a lovely perennial wild flower with dense clouds of yellow flowers in July and August and surely deserves a place in the dye garden? Wild Madder (Rubia peregrina) found growing in a hedgerow near Brixham, Devon 2nd Jan 2017. Photo by Brian Bond. 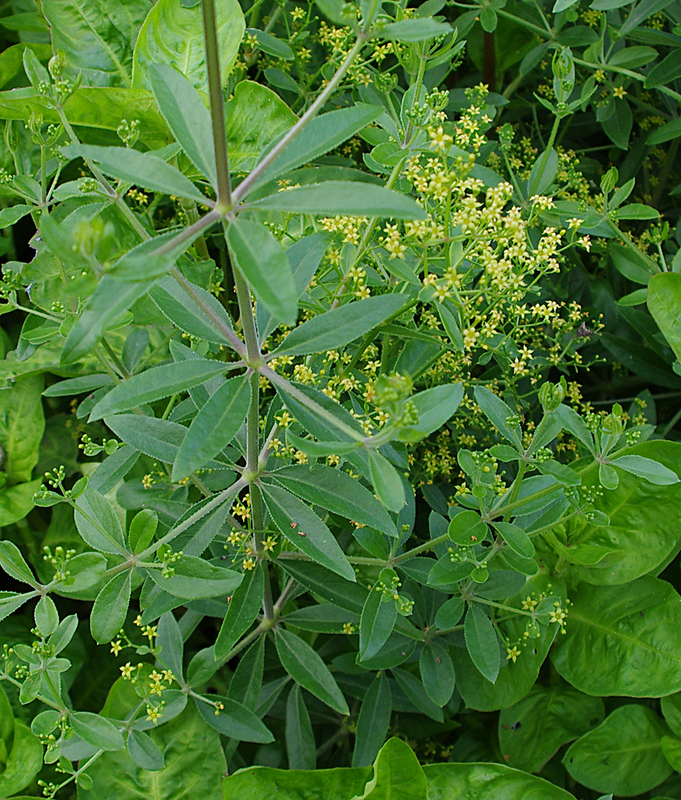 It is said in the literature that these relatives of madder do not provide as much colour as Common Madder, primarily because the plants are harder to harvest and the roots are thinner. Even the common weed, Cleavers or Goosegrass (Galium aparine) is said to contain similar pigments to Common Madder although its thin roots are unlikely to yield enough for true reds. 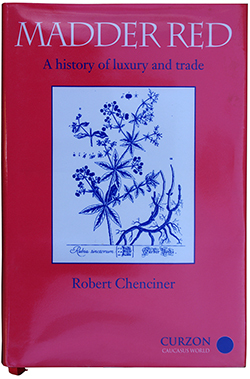 A further article based on the book “Madder Red” by Robert Chenciner will be posted later in the spring when I’ll be looking at the history of growing madder and its lessons for the craft grower. 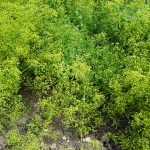 Ecotone Threads (another really good blog post on growing Madder by Kori Hargreaves in California). This entry was posted in Ashley's posts, Grand teint, growing dye plants, Growing Madder, madder and tagged Common Madder, Grand teint, Growing dye plants, Madder, Natural dyeing, Rubia peregrina, Rubia tinctorum, Wild Madder on 21st January 2017 by susan dye.